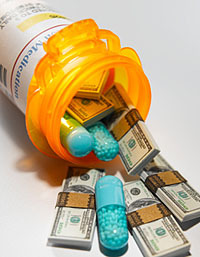 companies and device manufacturers….The only way to tackle such a huge project is with money, and indeed, the Obama administration recognizes this fact by including $1.1 billion in comparative effectiveness research in the economic stimulus package. Clearly, the pharmaceutical and device industry would like both the public and physicians to continue to assume that “newer means better.” Not asking these questions allows them to continue promoting profit-making brand-name treatments. Their motives in attempting to quash comparative effectiveness research could not be more obvious. Indeed, their motives are obvious: They know perfectly well that a lot of their newest and priciest treatments aren’t any better than the stuff going off patent next year, and they’d just as soon no one knew that fact. But I’d like to know, and I’m positively delighted to kick in my share of that $1.1 billion to find out. Anyone who’s not a pharmaceutical executive ought to be pretty happy about it too. Ezra has more on how the whole scam works.